Recently we’ve seen new Chromebook models from Acer, Samsung and more recently Lenovo, and a spec sheet discovered on HP’s site shows that they too are throwing their hats into the cloud-based computing ring. The PDF states that the 14″ 1366 x 768 Pavilion Chromebook is capable of running for 4 hours 15 minutes on a charge, and the remainder of its hardware appears reminiscent of a mashup between Acer’s C7 and Samsung’s Series 3, with the C7’s 1.1GHz Intel Celeron 847 processor coupled with 16GB of solid state storage as found in the Samsung model. The whole package weighs in at 1.8kg and it features 3 USB 2.0 ports and an HDMI port, although a disc drive remains absent. There is no word on when we will see this hitting store shelves, but another major Windows manufacturer beginning Chromebook production is bound to cause shivers in Redmond. 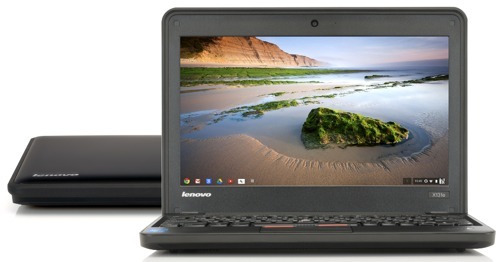 Google’s family of Chrome OS-powered devices has expanded again today with Lenovo’s announcement of the ThinkPad X131e Chromebook, a variant of the existing Windows-powered machine. Pitched by the company exclusively towards the education market, the ThinkPad X131e Chromebook features reinforced hinges and a ‘rugged’ design that is sure to keep it safe around any child, but the 1.77kg machine is not likely to be as child-friendly as the 1.10kg Samsung Series 3 Chromebook, which, like the Lenovo, features an 11.6″ 1366 x 768 matte display and around 6.5 hours of battery, a figure which Lenovo claims should last the entire school day. Unlike the latest Samsung model, however, the X131e sports an as-yet-unspecified Intel processor and is not currently expected to get a wide release. Interested schools will be able to pick them up from February 26th for $429 (£268) with an optional $30 (£19) charge ensuring support from Google. Compared to the $249/£229 Samsung Series 3 Chromebook, the X131e does not look like the best of deals, but a third manufacturer joining the Chrome OS family after the release of the Acer C7 earlier this year only serves as encouragement for the browser-loving among us.